We are proud to introduce this luxurious bedding collection made of the finest bamboo and organic cotton yarns to create this 300 thread count fabric with a uniquely soft, smooth touch. (60% rayon from bamboo, 40% Organic Cotton and 300 Thread count). The rayon from bamboo yarn comes from the bamboo tree which grows in a pesticide free environment. Its absorption is superior to cotton, its softness incomparable. 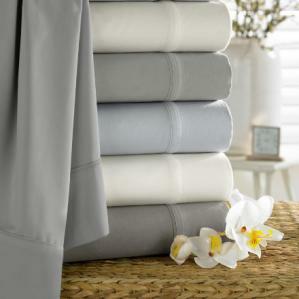 Indulge in the superior comfort of certified organic cotton and sustainable benefits of using bamboo. Supreme Luxury crafted with environmentally-friendly sustainable materials for the ultimate sleeping experience. 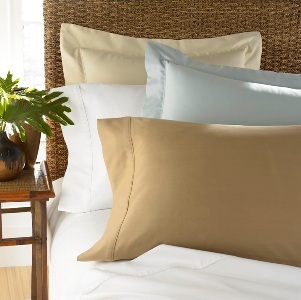 Naturally soft and exceptionally comfortable, Bamboo linens are here to stay! The unique structure of rayon from Bamboo yarn provides for superior ventilation & wicking action, keeping you cool & comfortable even on the hottest summer evenings and warm & cozy even on the coldest winter nights. Easy to care for, outstanding colorfastness and naturally antibacterial. Cool & comfortable when hot. Warm & cozy when cold. Machine washable, easy care & outstanding colorfastness.